Earlier this week Eric Lundgren was sentenced to 15 months in prison for selling what Microsoft claimed was “counterfeit software,” but which was in fact only recovery CDs loaded with data anyone can download for free. The company has now put up a blog post setting “the facts” straight, though it’s something of a limited set of those facts. “We are sharing this information now and responding publicly because we believe both Microsoft’s role in the case and the facts themselves are being misrepresented,” the company wrote. But it carefully avoids the deliberate misconception about software that it promulgated in court. That misconception, which vastly overstated Lundgren’s crime and led to the sentence he received, is simply to conflate software with a license to operate that software. Without going into details (my original post spells it out at length) it maintained in court that the discs Lundgren was attempting to sell were equivalent to entire licensed operating systems, when they were simply recovery discs that any user, refurbisher, or manufacturer can download and burn for free. Lundgren was going to sell them to repair shops for a quarter each so they could hand them out to people who needed them. Hardly anyone even makes these discs any more, certainly not Microsoft, and they’re pretty much worthless without a licensed copy of the OS in the first place. But Microsoft convinced the judges that a piece of software with no license or product key — meaning it won’t work properly, if at all — is worth the same as one with a license. 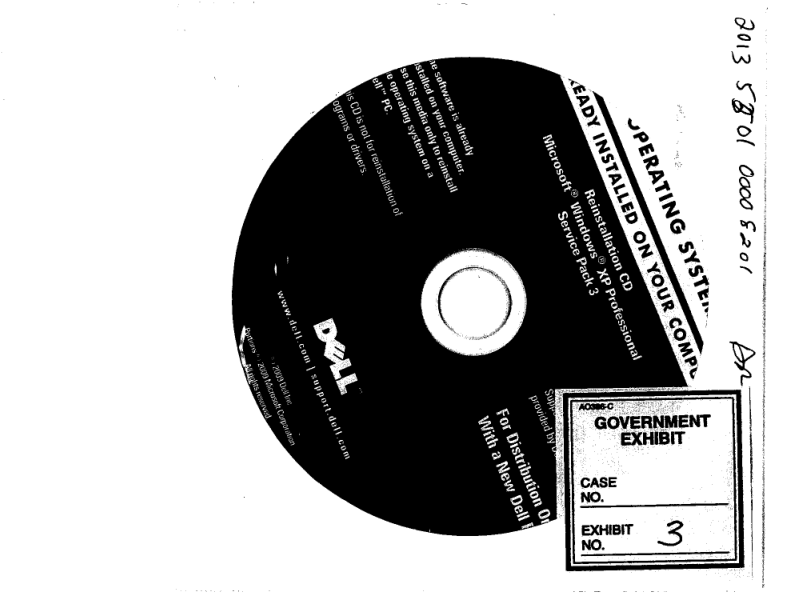 Lundgren had already pleaded guilty to infringing Dell’s trademark by copying the look of its discs, but the value Microsoft convinced the judges those discs have (a total of $700,000) directly led to his 15-month sentence. Anyway, the company isn’t happy with the look it has of sending a guy to prison for stealing something with no value to anyone but someone with a bum computer and no backup. It summarizes what it thinks are the most important points as follows, with my commentary following the bullets. Microsoft did not bring this case: U.S. Customs referred the case to federal prosecutors after intercepting shipments of counterfeit software imported from China by Mr. Lundgren. This is perfectly true, however Microsoft has continually misrepresented the nature and value of the discs, falsely claiming that they led to lost sales. That’s not possible, of course, since Microsoft gives the contents of these discs away for free. It sells licenses to operate Windows, something you’d have to have already if you wanted to use the discs in the first place. Lundgren established an elaborate counterfeit supply chain in China: Mr. Lundgren traveled extensively in China to set up a production line and designed counterfeit molds for Microsoft software in order to unlawfully manufacture counterfeit discs in significant volumes. Microsoft is trying to make it sound like the guy is some criminal mastermind running some big time Windows pirating empire. He literally gave a Dell recovery disc to a duplication shop and told them to make exact copies of it, including the label and paper sleeve. Lundgren failed to stop after being warned: Mr. Lundgren was even warned by a customs seizure notice that his conduct was illegal and given the opportunity to stop before he was prosecuted. I can’t speak to this one, but Lundgren told me that the first notice he had that this was being pursued by anyone was when they raided his house. The monetary value of the discs was so small and the counterfeiting piece so minor (fake labels for duplicates of discs that Dell doesn’t even provide any more) that if anything it would be a fine and confiscation of the shipment, not a 5-year case alleging millions in damages. Lundgren pleaded guilty: The counterfeit discs obtained by Mr. Lundgren were sold to refurbishers in the United States for his personal profit and Mr. Lundgren and his codefendant both pleaded guilty to federal felony crimes. Lundgren pleaded guilty to counterfeiting the Dell discs, not to counterfeiting Microsoft software. It’s an important distinction because the discs are nearly worthless and copyright crimes are sentenced based on the value of the infringed item. Lundgren went to great lengths to mislead people: His own emails submitted as evidence in the case show the lengths to which Mr. Lundgren went in an attempt to make his counterfeit software look like genuine software. They also show him directing his co-defendant to find less discerning customers who would be more easily deceived if people objected to the counterfeits. Printing an accurate copy of a label for a disc isn’t exactly “great lengths.” Early on the company in China printed “Made in USA” on the disc and “Made in Canada” on the sleeve, and had a yellow background when it should have been green — that’s the kind of thing he was fixing. Lundgren intended to profit from his actions: His own emails submitted as evidence before the court make clear that Mr. Lundgren’s motivation was to sell counterfeit software to generate income for himself. The plan was to sell these nearly worthless discs —remember, anybody can make one for free — for a quarter each to refurbishers. Records, however, show that Lundgren had sold several thousand to one buyer for $3-4 each, which is contrary to this assertion. I’ve asked him for clarification on this. Microsoft has a strong program to support legitimate refurbishers and recyclers: Our program supports hundreds of legitimate recyclers, while protecting customers. The implication is that that Lundgren is not a legitimate refurbisher or recycler. He pointed out earlier, however, that his company, which handles recycling for Lenovo, Nintendo, and others, takes care of more e-waste in a year than Microsoft has in a decade. When a refurbisher installs a fresh version of Windows on a refurbished PC, we charge a discounted rate of $25 for the software and a new license – it is not free. But if they’re not installing a fresh version of Windows, because the machine already has a licensed copy on it, as so many do, the software is free. There’s no limit on how many a company can make on its own; Microsoft only charges for the licenses. Here, go make one yourself in case you need to do it. Mr. Lundgren’s scheme was simple. He was counterfeiting Windows software in China and importing it to the United States. Mr. Lundgren intended the software to be sold to the refurbisher community as if it was a legitimate, licensed copy of Windows. These are not licensed copies of Windows! They’re discs anyone can make, and that manufacturers and refurbishers can print as many of as they like, to give to customers who already have a copy of Windows. These discs are for repairing or re-installing a copy of the OS. They did not come with licenses and Lundgren was not selling or providing licenses. Don’t let Microsoft fool you the way they helped fool the judges. A recovery disc is something you or I or a refurbisher can make right now for free. A license to operate Windows comes from Microsoft and costs good money. They’re not the same thing and Lundgren was going to sell the former, not the latter. I’ve asked Microsoft to explain this last point and will update the post if I hear back.